The Museum was acquired from the City Council and City Fathers in 1982 and was set up as The South Yorkshire Fire Service Historical Society. 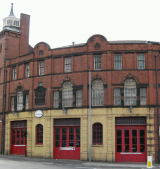 The building had stood derelict for many years and fire-fighters from the South Yorkshire Brigade began to refurbish the Victorian Police and Fire Station so that a permanent home would be found for the vast range of fire service related memorabilia that was sitting in attics and local fire stations all over the county. By August 1985 the museum was ready to open it's doors. Though much work has been done, there is still a tremendous amount to be done to restore all the rooms to full use. Incidentally, the first job ever tackled was the eviction of squatters in the shape of a flock of pigeons. Some years later a new 'infestation' has arisen. Please note that we may close from time to time due to events etc... please check the museums events page for more information.